As per section 32 (1) of V C I Act the State Government shall establish State Veterinary Council consist of the following members. Four members elected from among themselves by Veterinary Practitioners Registered in the State Veterinary Council. Three members nominated by the State Government. The Director of the Veterinary Services of the State ( by what ever name called) ex officio. One member to be nominated by the State Veterinary Association. Registrar of the State Veterinary Council ex officio. As per the Provision 32 (1) (a) four members have already been elected through the Election conducted by Returning officer and Orders for notification for the elected member have already been obtained. As per 32 (1) (c) government orders nominating three members have already been Obtained. As per the Provision 32 (1) (f) Government orders for the nomination of one member by state Veterinary Association has already been received. The Executive Orders for constitution of the Council with the remaining members as per the provision of Act has been issued by the Government for which necessary orders have been received vide G.O. (Ms) No: 120 Animal Husbandry, Dairying & Fisheries (AH3) Department Dated. 15.09.2010. On receipt of the Executive Orders from the Government, the first meeting of the Tamilnadu State Veterinary Council was held on 6.10.2010. During the first meeting, Dr. B.Saravanan, member of the Council nominated by the Tamilnadu State Veterinary Assistant Surgeons' Association, has been unanimously elected as President of the Tamilnadu State Veterinary Council. 2. Dean, Madras Veterinary College, Vepery, Chennai-7. 4. 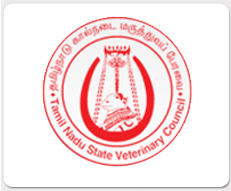 Registrar, Tamilnadu State Veterinary Council. Copyright Tamilnadu State Veterinary Council. All Rights Reserved.